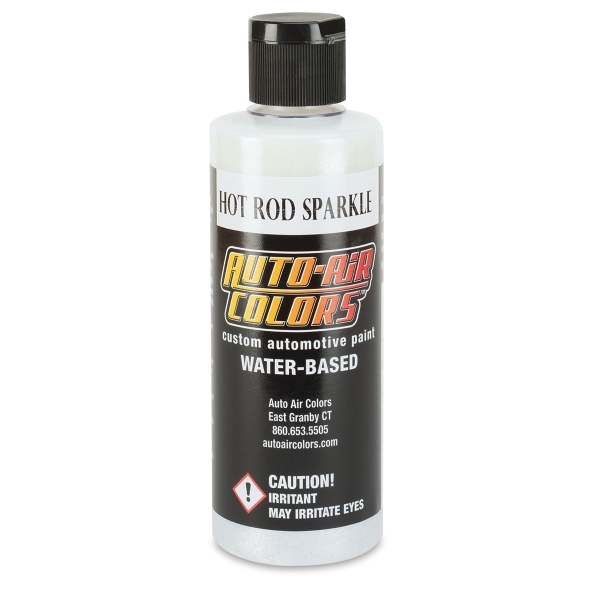 For a shimmering finish, airbrush artists use Auto Air 4300 Series Metallic Colors. These Createx airbrush paints are semi-opaque with a semi-gloss finish. They're best used over AutoBorne Sealer Black or Semi-Opaque Deep Black. Use them alone or as a base for Transparent or Candy Auto Air Colors. Hot Rod Sparkle White is a transparent pearl-flake that universally keys with any color to create a large pearl effect. Apply it as a pearl mid-coat over a base color or directly mix it with other Auto Air Colors for a unique, pearlized effect.